The 1111 Lincoln Road is nearing completion and the parking garage is open for business. 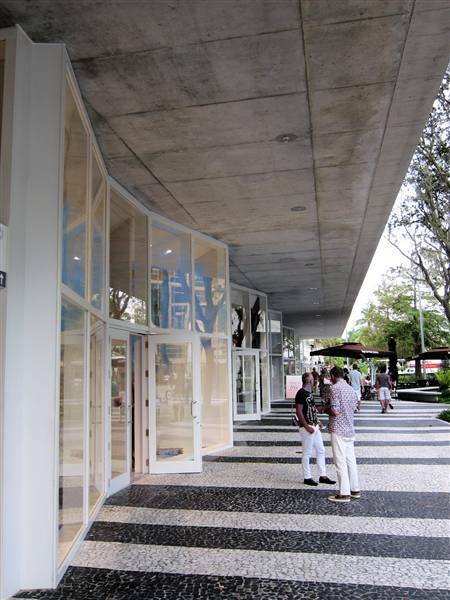 This building is already becoming one of Miami's most architecturally significant and fun buildings. It is brilliant in design and function. The architects Herczog and de Meuron solved a "highest and best use" problem that limited an office building by zoning to two-thirds of the 114' height of the existing Suntrust Building adjacent to it (east). This would have limited the new building to approximately 85 feet in height. The structure is located across from the Lincoln Theatre and it anchors the west side of Lincoln Road Mall. The parking levels vary in height adding interest and providing volume an interest to the building. There is a mix of retail, residential and parking. Alchemist, a women's clothing store is located on the 5th level of the structure and faces west. It contains floor to ceiling storefront glass similar to the ground floor retail stores. The photo at above was taken at the east end of the garage looking north showing the stairs connecting 1111 Lincoln Road to the Suntrust office building. The building contains: 40,000 square foot of retail space on the ground level including several restaurants, the 5th floor Alchemenst store, a 25,000 square foot "event space" and residences on the top level. The structure is predominantly poured, reinforced concrete that is unpainted containing cantilevered overhangs. There is aluminum and glass, wire (strand) railings, and round metal "chalks" painted black and white for wheel stops. There are no exterior walls other than the "storefront glass" visible on the west elevation and ground level (see photos below). From a distance one can see cars parked on the cantilevered edges of the building. 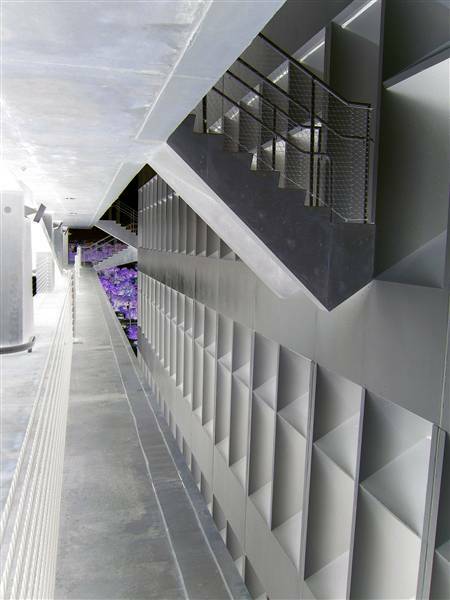 The interior stairways are also cantilevered and form various angles that make them architecturally interesting. The parking structure is connected via several small stairways connect the office building. Retail shops facing south on the Lincoln Road Mall level include Taschen and the Shake Shack.